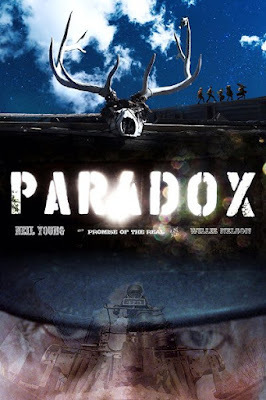 Paradox, the Daryl Hannah directed Neil Young movie premiering at SXSW 2018, has been picked up by Netflix. Hannah describes Paradox as “a loud poem”. The movie is somewhat of a cowboy flick with Young starring with his band Promise of the Real featuring Lukas Nelson. Lukas’ father Willie Nelson is also in the movie. The film will premiere at the SXSW Film Festival at the Paramount Theatre, Austin, TX, on March 15, 2018 at 7:00 PM. The movie blurb states, “Time is fluid in this far-fetched, whimsical western tale of music and love. Somewhere in the future past, The Man In the Black Hat hides out between heists at an old stagecoach stop with Jail Time, the Particle Kid, and an odd band of outlaws. Mining the detritus of past civilizations, they wait… for the Silver Eagle, for the womenfolk, and for the full moon’s magic to give rise to the music and make the spirits fly”. The Paradox soundtrack, featuring original music by Neil Young + Promise of the Real, will be released on April 20, 2018.